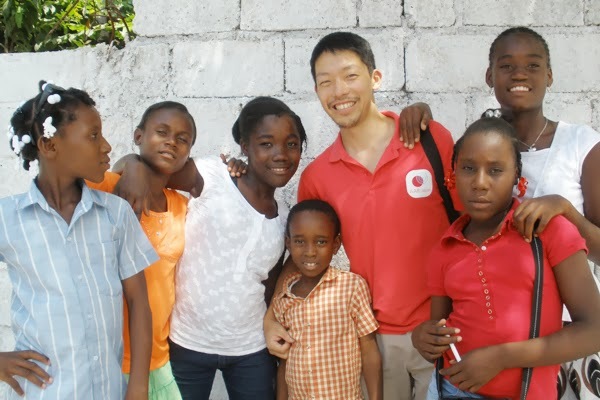 The Republic of Haiti, where AAR Japan has operated since when the country was hit by the devastating earthquake in January 2010, has been one of the poorest countries in the western hemisphere even before the earthquake. The country suffers poor infrastructure including roads, schools and hospitals and among others, the lack of sanitation facilities such as latrines and hand-washing facilities is severe. Added to this constant want, the earthquake devastated the country and forced Haitian people to live in the worsened sanitary condition. 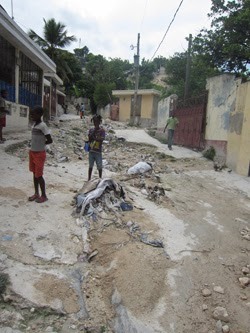 This led to the further prevalence of cholera in the autumn of 2010, which resulted in approximately 580,000 cases of infection and casualty of around 8,000 people. 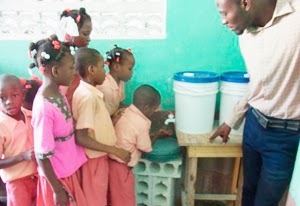 The government of Haiti also recognizes that promotion of good hygiene among children is one of the most urgent issues to address. 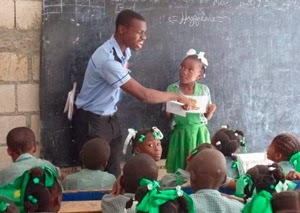 A survey conducted by the Ministry of Education of Haiti revealed that children at 80% schools have not acquired proper hygiene practices including use of latrine and washing hands after defecation, as well as casting light on the insufficient number of latrines and hand-washing facilities. Therefore in February 2013, AAR Japan launched a project which aims to improve the hygiene situation at 8 elementary schools in Carrefour, Port-au-Prince where cholera is severely pervasive. 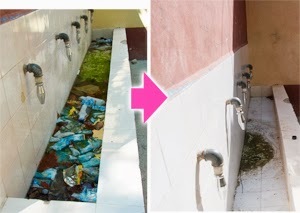 In Carrefour, most schools do not have water supply and sewerage systems. AAR Japan thus constructs latrines and installs rain water storage tank to store water for washing hands and for cleaning. However, merely installing equipment does not lead to the reduction of risk for infectious diseases. It is essential that children habituate themselves with good hygiene behaviors such as washing hands and cleaning their surroundings. 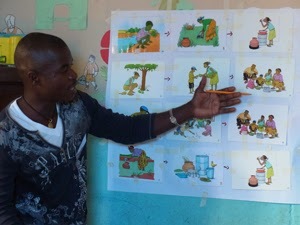 This is how we came up with the idea of conducting training for teachers on hygiene education. The first training session was held in the end of March 2013 and 3 from each 8 schools, including teachers and school staffs, participated. 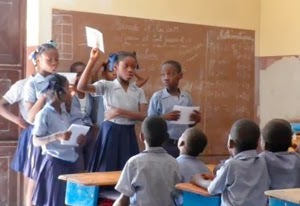 In the session, as well as the knowledge on sanitation and hygiene, participants learned the method of ‘participatory lessons’, a way of teaching in which children themselves think about the problems and solutions rather than teachers merely telling them what is the issue and how to solve. The session contained a role playing part and a staff member of AAR Japan acted as teacher, showing an illustration of a child defecating outside and casting a question to participants such as ‘what is the problem in this picture?’, ‘in reality how is the situation around your school?’ and ‘what do you think you should do when you see such behavior?’ etc. The participants themselves contemplated and sought for the answer. Most of them had never even heard the word ‘participatory lessons’ but they eagerly dived into and learned in the session. ‘Where the germs and virus that cause diseases come from?’ The participants practiced teaching using illustration cards (March 26th, 2013). 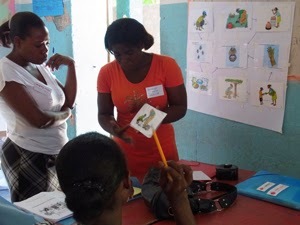 ‘Everything in the session feels very new to me’, commented Robeinson, a teacher who participated in the session. On the right is Shoichi TOYOI, a staff member of AAR Japan (April 29th, 2013). 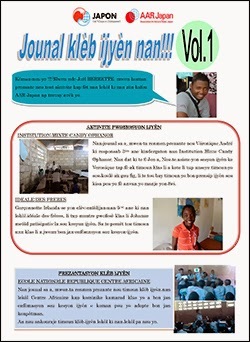 After the six-day session, we interviewed Robenson Wilfrid MARIEN (20), one of the participating teachers. He told us in a vigorous manner, ‘I taught children in my class using the method I learned in the training. Children participated much more actively than before and were well concentrated. I noticed the children’s clothes became cleaner than before. I wish to learn more of new teaching method in the next session’. In July, we carried out the second session. Each participant reviewed how they had carried out hygiene education at each school and actively discussed on the outcomes and challenges. There was an opinion which points out, ‘not only at schools, it is also important to be careful about hygiene at households, too’, which made us realize that the participating teachers had deepened understanding on the issue of sanitation and hygiene. Added to all the abovementioned activities, AAR Japan facilitated each school to form ‘Hygiene Club’ which consists of children. The members of Hygiene Club lead the school’s initiative of promoting good hygiene through various activities such as allocating cleaning duty of latrines and hand-washing facilities among children and conveying knowledge on sanitation and hygiene to other children. AAR Japan supports their initiative through organizing a hygiene event in which each hygiene club makes a presentation on their activities and through publishing monthly school hygiene newspapers which introduce the activities at each school. Although many teachers and children know the importance of using latrines and washing hands, the knowledge is not put into action. The education which merely conveys information and knowledge will not change their behavior. We will continue our activities so that children and teachers are better equipped with the knowledge and good behavior on sanitation and hygiene. *This project is funded by Ministry of Foreign Affairs, Japan as well as your generous donation. HIRAMA has been engaged in Haiti operation since June 2012. He was involved in activities against HIV/AIDS in Benin, West Africa for two years. 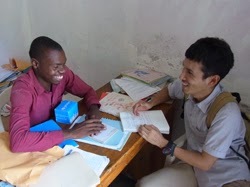 HIRAMA joined AAR Japan after completing master’s degree on global health. Originally from Hokkaido.